- It is found that meanders influence the pathways by which water is upwelled from below the Agulhas Current up onto the shelf, thus influencing the supply of nutrients to the shelf ecosystem, says one of the authors, Annette Samuelsen, at the Nansen Center. This paper focuses physical mechanism behind the shelf-slope exchange on the Eastern Agulhas Bank. 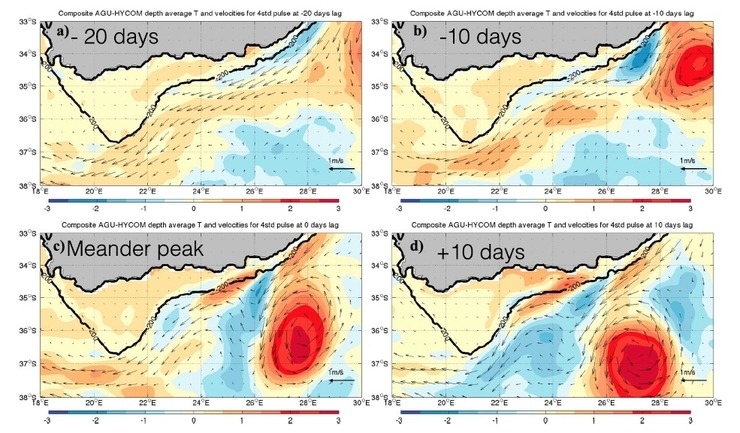 Two ocean models show, with small spatial differences, that large meander events drive strong shear between Agulhas Current core waters and shelf waters on their leading and trailing edges. This shear produces areas of strong negative vorticity and drives upwelling events in the bottom boundary layer, resulting in a significant decrease in subsurface temperatures at the shelf edge. These areas of strong shear can move up or down the shelf depending on the wavelength of the meander. The inshore cyclone associated with large meander events is advected offshore and eroded by the widening of the continental shelf west of 26∘E and the relaxation of the shelf slope, thus creating a different upwelling regime in the shelf waters of the Agulhas Bank compared to the narrower shelf further upstream (north of 34∘S). Therefore, the supply of cold water from depth onto the Agulhas shelf is a byproduct of intensification of the flow during mesoscale meander events due to their interaction with a changing shelf slope, but the geographical location of this shelf edge upwelling will change with different meander geometry and thus may be sensitive to changes in the variability of the Agulhas Current. This is demonstrated by the temporally different upwelling responses seen in the two models used here. This shelf edge upwelling can be forced both by Ekman veering at the shelf edge, as well as a steepening of isotherms on the inshore edge of the current to maintain geostrophy in response to an intensification of the Agulhas Current core. Recent long-term observations (Beal & Elipot, 2016) indicate a broadening in the Agulhas Current as a result of increased EKE related to fastermoving eddies noted in Backeberg et al. (2012). It is possible that this broadening could mean an eastward shift and intensification of shelf edge upwelling, as seen in AGU-HYCOM, which has a broader current and more mesoscale variability compared to the narrower, more stable Agulhas Current simulated by INALT01. Interactions in the Eastern Agulhas Bank shear zone are complex and not sufficiently resolved in this study, with recent glider operations providing the first high-resolution observations of this front (Krug et al., 2017). This work revealed the generation of submesoscale cyclones as a result of shear instabilities during a nonmeandering phase of the current. The effect of the strengthening of the shear during meander events has on these frontal dynamics is currently not known and will require a new generation of submesoscale resolving ocean models to be examined in order to properly place these mechanisms into a larger context and fully understand the interactions of wind and current driving upwelling on the inner shelf.